Road tip: The Onlies' 2013 West Coast Tour itinerary: Portland, Ore., Arcata, Berkely, and Palo Alto, Calif., and Cottage Grove., Ore.
Well, we're getting close. Packing, planning, renting a van, all that stuff before a road trip. Our dads Johnny and Tom will be our chauffeurs, roadies, and merch sales staff, but they won't be our sugar daddies: We're actually paying for most of the trip--and the destination fiddle camp--through money we've made at gigs and other performances. Wahoo -- does that make us professional musicians? Anyway, our itinerary includes five West Coast stops, and if you can't attend any of them, well, at least make sure your friends do! Portland is our first stop on Tuesday (Aug. 20), for a 7:30 p.m. house concert at our friend Etienne's. Then on Wednesday (Aug. 21), amid the redwoods of Northern California, we'll do a second house concert chez another friend, Jennifer MacKey, a fiddler and artist who lives in Rio Dell, Calif., just south of Arcata. That one starts at 8 p.m. On Thursday (Aug. 22), we'll do a third house concert in as many days, this one at 7:30 p.m. in North Berkeley, with Brad and Lisa Gallien. Then we spend a week at Alasdair Fraser's Valley of the Moon Fiddle School, after which we play a contra dance in Palo Alto (8 p.m. Saturday, Aug. 31) and, the next day, a pub gig at Cottage Grove's Axe & Fiddle (7:00 p.m. Sept. 1). Whew. And we hope to pack in a few college visits too. Details on the dance locations, prices, and so forth will be found on our calendar page! 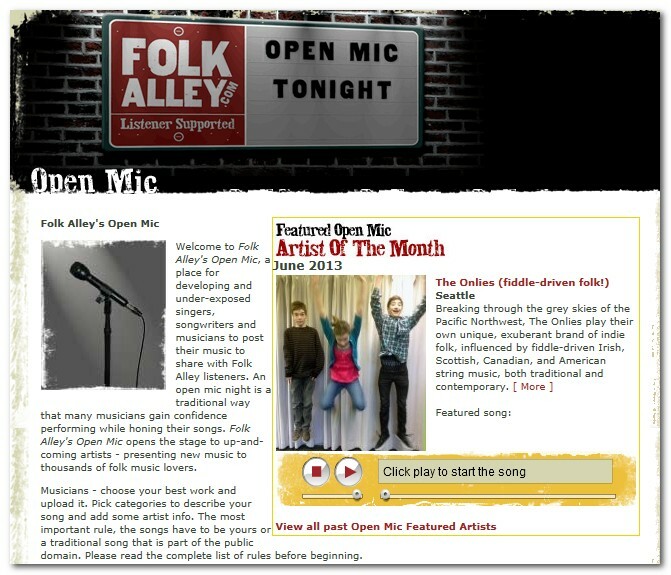 Onlies are Folk Alley's Open Mic Artist of the Month, June 2013! What a treat and honor -- that way cool online-folk-radio site FolkAlley.com named us its Artist of the Month in its Open Mic section for up-and-coming artists. We are honored, and recommend you visit the site. A few of our tunes are available there, and tons more, including interviews and reviews of musicians we love. Check it out! Well, we tried to do both Jimi and our national anthem justice. We added a little old-time tune to the end, too. Let us know what you think. And please, if you like it, please share it widely! 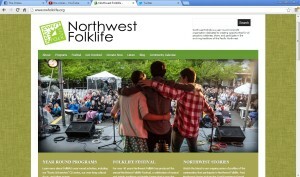 Well, not the cover of the Rolling Stone, but the cover of Northwest Folklife Web site. That's us (at least as we write this). Thank you to Folklife's rock-star photographer Dan Thornton: It's a fabulous portrait of our affection for each other and for our wonderful audiences--thanks so much for braving the rain last weekend and attending our show. It was one of our favorites ever!!! Oh, and if the link above doesn't include our photo, here's the evergreen post containing it. 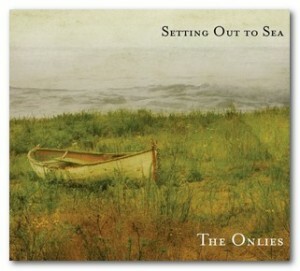 Author admin@TheOnlies.comPublished on April 8, 2013 April 8, 2013 2 Comments on ‘Setting Out to Sea’ available now!!! It’s official – “Setting Out to Sea” is now available online, which means people from beyond Seattle and Portland (well, anybody who didn’t make our CD-release gigs) can listen to and purchase it now. We are so dang proud of the CD, and we’ve every hope you’ll love it as much as we do. For those of you who don’t know, it’s got 14 cuts, three of which are songs we wrote, plus a number of original fiddle tunes, too. True to our diverse styles, the CD crosses genres: Scottish, Irish, American old-time, French Canadian, Cape Breton, and a few that are harder to classify. A cut by Liz Carroll makes an appearance, as does “I’m Not Fed Up With The Pacific Ocean” by Ola Backstrom. Our buddy and frequent co-collaborator RuthMabel Boytz sits in on bass on several tracks, and we were lucky enough to land some beautiful cello support from Mila Phelps-Friedl. We really hope you enjoy the album. If the urge grabs you, buy copies for friends (we plow all proceeds into fiddle camps), and tell everyone you know, and write your own review on your blog or any of the sites above. And let us know what you think! Thanks for listening! Published on April 8, 2013 April 8, 2013 Author admin@TheOnlies.comCategories Uncategorized2 Comments on ‘Setting Out to Sea’ available now!!! Have Fun at Seattle’s Moisture Festival! We're excited and honored to be playing short sets at two Moisture Festival shows over the next few weeks. As most Seattleites know, the Festival is a monthlong series of comic, musical, vaudevillian, aerialist, thow-that-fun-thing-in-too performances. It bills itself as "is the world's largest Comedy/Varietè festival," and we don't hear anybody arguing with that claim. We'll be playing twice, both times during family-friendly events: 3 p.m. Sunday, March 31 at the Broadway Performance Hall on Capitol Hill, and 7:30 p.m. Sunday, April 7 at Hale's Palladium in Ballard. 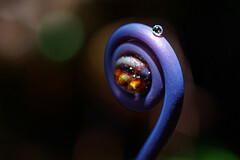 Check out the rest of the artists who will be in the show! Tickets are $10-$20. Hot off the presses: Only lyrics! For the lyric-obsessed among you, here's a link to lyrics for the new CD!